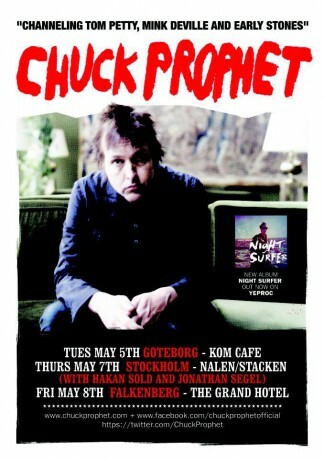 Thursday 7 May Hawk is doing a solo gig – togehter with Jonathan Segel (Camper Van Beethoven), opening for ex-Green on Red-cat Chuck Prophet at Stacken, Nalen, Stockholm. Hawk´s playing acoustic guitar and Jonathan´s playing fiddle. Chuck Prophet too is doing a solo acoustic performance. Stacken, Nalen is at David Bagares Gata 17 in Central Stockholm. Doors: 8 pm. Tickets: 240 SEK. Posted on Tuesday, May 5th, 2015 at 6:49 am.